The Eye is one of the most delicate organs of the body. Proper care must be given to the eye at all times. Even when your eyes are closed, you will find it hard to cope. Anytime you contact an eye infection, going about your daily activities becomes difficult. Your productivity is usually low. This is why we must ensure that adequate care is given to this organ of sight at all times. It is advisable to go for an “eye check-up” from time to time to be sure the eye is safe from contacting any eye infection. Due to long hours of reading, Juan, 18, student, used to strain her eyes a lot. At times, she used to stay up for long hours either to write one article or to complete one assignment of the other. After some time, she began to feel pain every now and then. Her eyes will begin to itch. Once she starts rubbing unconsciously, it will just turn red. At times, it will get to an extent where water will just be dripping from her eyes just like someone crying. She visited an optician one day to complain about the eyes. She was advised to try as much as possible to shorten her long hours of reading, include more of vegetables and fruits in her diet and some other foods enriched with vitamin A. the doctor prescribed Visine eye drop for her to be apply anytime she noticed her eyes were beginning to get sore. She kept using the eye drop for sometimes. As a matter of fact, it was working well. But the drug had few side effects. Her eyes will just begin to itch some hours after using the eye drop. She will not be able to resist any hand rubbing action. The eye drop that reduced the soreness is now causing itches. The eye drop also had something like a bitter after effect taste. Some form of irritation began to occur around her eye lid area. She had to stop using the eye drop. 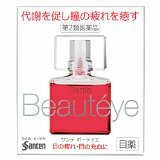 In her search for another alternative, she came in contact with a Japanese eye drop called Sante Beauteye Eye Drop on an online store. She got it and began to apply it to her sore eyes. Two drops were enough to soothe her anytime she began to feel the eye pains. The drug worked a lot to great effect. Water stopped dripping from her eyes, the soreness were gone too. She only applied the drugs anytime the soreness begins to occur. After using it for up to two weeks, the soreness stopped to occur. She could now work and read for longer working hours without feeling any eye pain. No side effects were noticed after usage. Sante Beauteye Eye Drop can be only be recommended for minor eye infections ranging from pains, soreness, reddish eye, itching and so on. In the case of some other complex eye diseases, infections or defects, it is advisable to visit your optician. Do not wait until you start feeling some form of pain in your eye before you decide to order this drug. Ensure you always have it in your first aid kit.